India Camel Milk Health Benefits - India Camel Milk - Sahara Dairy Co.
Camel milk has been consumed in India, Africa and the Middle East for thousands of years. Since the beginning of time, camel milk has been a vital source of nutrients for desert communities. Without this superfood, they would have had no way to survive the harsh living conditions and unforgiving desert climate. Camels were so important to their survival, the Bedouins, or nomadic Arabs of the desert, refer to them as “Ata Allah” – the gift from God. To this very day the Bedouins worship and protect these great animals at all costs and continue to consume camel milk for its nutrients and many health benefits. Camel milk is just now making its way to American culture as more and more people are beginning to understand the stark nutritional contrast between cow milk and camel milk. But don’t be fooled, as not all camel milk is produced the same. There are less than 3,000 camels living in the United States, which drives up cost. To make a profit, inexperienced US camel farmers feed their livestock a diet of grass and grains, which is neglectful to their naturally diverse and healthy diet. The poor diet of US camels not only affects the quality of the product (poor nutrient values), it also affects the taste. Many find US camel milk to be gamey and not comparable at all to India camel milk. Sahara Dairy Co. is proud to have the Bedouins raise and look after our camels in the beautiful lands of Rajasthan, India. They have been herding, raising and milking camels on this land for thousands of years. The health and well-being of camels is of large importance to the rural economy in India, so much so that the Prime Minister recognized the export of India camel milk as integral to the well-being of the less privileged farming community. Our farmers do not treat camels as a farming crop like the US camel farms. Rather, our farmers treat the camels as a vital source of life and survival. Our camels graze on more than 50 different plants and naturally medicinal herbs present only in India. This all-natural diet produces superior milk in nutrients, quality and taste compared to US camels. Furthermore, Sahara Dairy Co. is one of the only camel milk companies to freeze dry our product, which is the highest quality drying method and the only way to retain all of the milk’s health benefits. Our freeze dry method locks in all of the vitamins and minerals our camels consume from their all-natural plant and herb diet. 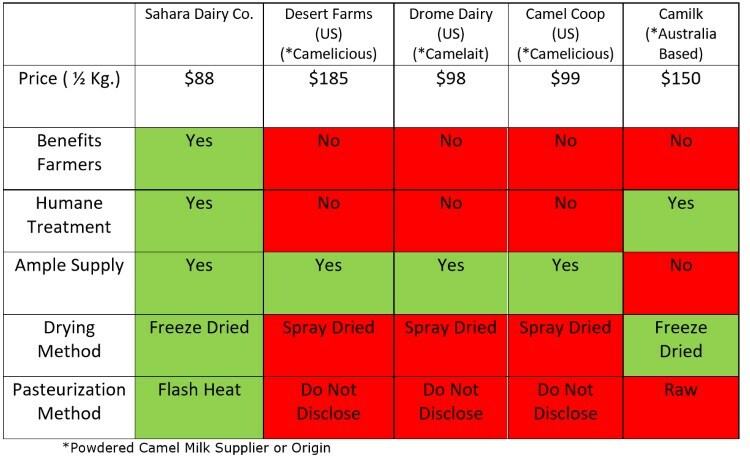 United States camel milk suppliers prefer to spray dry their milk, which degrades the quality, taste and content. US farms prefer to spray dry because it is faster and less expensive, and yet – you will find that Sahara Dairy Co. is significantly less expensive than our competitors. Now that you know the truth about where your camel milk comes from, choose the highest quality India camel milk on the market with Sahara Dairy Co.’s freeze dried camel milk.